Home » Trading Setups » Silver sends a reversal signal to those who can read it! Silver sends a reversal signal to those who can read it! Yesterday could have been a normal day for many, but not for precious metals traders. Silver’s breathtaking rally caught many by surprise and sent the former to as high as $16.79 from a session low of $14.12! The fundamentals behind this drastic surge are not yet fully clarified, but they will not be subject of this article anyway. The technical implications of the sharp movement to the upside are far more interesting. The silver chart above tells the whole story: a sharp dip below $15.03, the November 7 low. 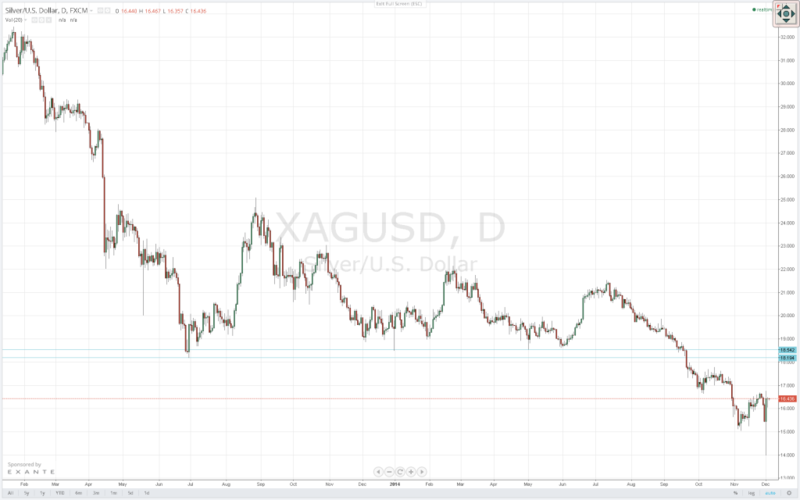 At the end of the day, however, it turned out to be a false break of the support level, as the precious metal skyrocketed to close at $16.45. On its way up it engulfed the previous two day’s candles (yet another bullish signal). The situation is ripe for taking advantage of silver’s upside potential. Current market levels provide good buying opportunities. Stops are an absolute must and should be placed below $15.50. Profits need to be taken at some point in the $18.20-$18.60 major resistance zone. Don’t get tricked by gold: it’s time to Sell, not to Buy! AUD/USD double bottom at 0.8650 provides good buying opportunities!